It hasn’t even been a year since the Family Justice Center was launched to address domestic violence in Spokane, but law enforcement, prosecutors and victim advocates say it’s already producing results. 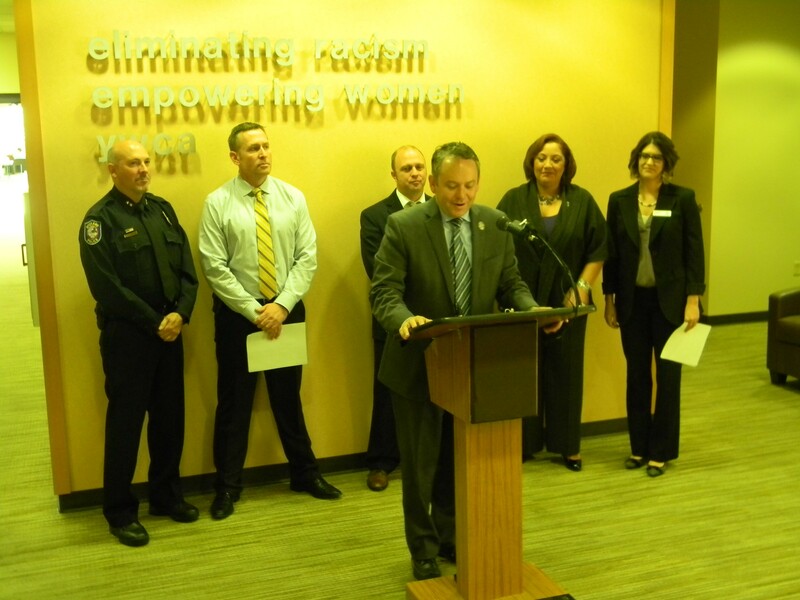 Mayor David Condon addressed reporters on Monday at the YWCA about a coordinated program aimed at domestic violence. Using national Domestic Violence Awareness Month as an opportunity to highlight its work, Mayor David Condon appeared at the YWCA where the center is housed to discuss how it brings together law enforcement and other services needed by victims of domestic violence. Speaking to a reporter, Lt. Mark Griffiths said a central goal of the program was to hold more offenders accountable. The police, he said, have more officers to follow up on victims and on misdemeanor assault cases. As a result, police followed up on 488 protective order violations, 313 domestic assault cases and 66 domestic violence arrest warrants. Lynden Smithson, a city attorney, said that follow up has helped successfully prosecute cases that might’ve been dropped in the past. The YWCA helps the victim get counseling, safe housing, food and childcare, as well as an advocate to help them access services and navigate the legal system. Regina Malveaux, CEO of the YWCA of Spokane, said the center is a best practices program that originated in San Diego and has been adopted by 25 cities. “Our clients no longer have to walk around downtown to get their needs met,” said Nia Platt, a YWCA paralegal.